No matter how advanced the medical technology becomes, it is care for humans that has been the ultimate dynamic force in medicine. We offer "People-Friendly products" to people in need of care as well as healthcare professionals. In consideration of patient safety and comfort a gentle to the skin adhesive has been developed for products that come into direct contact with the skin. With conventional tape upon removal, it has proven difficult to totally prevent damage, redness and irritation to the skin. By focusing on the stratum peeled off with adhesive tapes, Nitto developed STRATAGEL® adhesive which includes a liquid gel component in the acrylic polymer matrix that minimizes the removal of the stratum corneum. STRATAGEL® adhesive has advantageous skin adhesion, easily removed, is pain free on removal to the skin and with less damage to the stratum corneum. 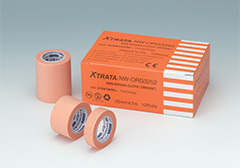 Surgical tapes are most frequently used in hospitals. Many patients experience skin irritation, as tapes are repeatedly attached and removed whenever gauze or tubes are changed. 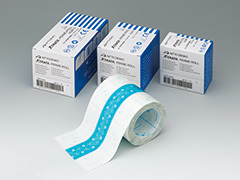 The use of STRATAGEL® adhesive in our surgical tapes reduces pain and skin irritation caused by removal of the tapes, and thereby offers added safety and comfort for all patients, especially the elderly, the young, those with fragile and frail skin, dialysis patients, or patients who are experiencing difficulties with conventional tapes. Transparent Dressing are adhesive sheets consisting of an adhesive thinly coated onto an ultrathin polyurethane film. 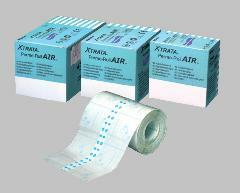 They are mainly used to protect wounds or affix catheters. XTRATA®dressings have excellent moisture permeability and employ the revolutionary STRATAGEL®adhesive that is less damaging to stratum corneum and gentle to the skin. This new roll-type film dressing is extra thin film that stretches with less stress provides pliability. Thickness is approx 1/4 of XTRATA® Perme-Roll. In addition, the use of STRATAGEL® reduces irritation that is caused during application and upon removal. The soft gel adhesive fits so well to skin surface that it realizes gentle removal of the dressing with minimum damage to stratum corneum. This roll-type film dressing is convenient and easily cut to size. An ultra-thin film ensure minimal discomfort on to the skin, whilst making the dressing impermeable to liquid and bacteria yet permeable to moisture vapor, which helps prevent maceration of the skin surface. 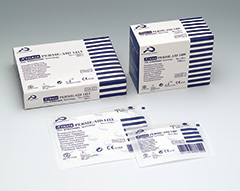 In addition, the use of STRATAGEL® adhesive enables the dressing to be removed in a manner that is gentle to the skin. Copyright© Nitoms, Inc. All Rights Reserved.